Since we ran a feature on Duncan Harris, the groovy "video game photographer" behind the website DeadEndThrills, I've been sharing some of his work each week here. This week has some great stuff, focusing largely on Mass Effect 2 and the Half-Life 2 mod/ghost story Dear Esther. Let's get to it! First up, at top, we've got one of several shots from Dear Esther, which will see its official Steam release on February 14th. I for one can't wait, and this kind of shot is why. Tools and tricks: free camera, custom FOV, 2160p rendering, antialiasing (injected SMAA). The first of several Mass Effect 2 shots, this one is simply… space. They say it's the final frontier. I can get with that. Tools and tricks: free camera, timestop, no-HUD, custom FOV, JeanLuc761′s hi-res character textures, in-world HUD textures blanked, antialiasing (injected max quality FXAA 3.11 w/ texture pre-sharpening), 2160p rendering. Alas, poor Veetor. Driven mad by the collector attack. Poor fellow. I hope none of you heartless bastards turned him over to Cerberus for testing. Tools and tricks: free camera, timestop, no-HUD, custom FOV, JeanLuc761′s hi-res character textures, in-world HUD textures blanked, antialiasing (injected ‘Ultra' quality SMAA + 4xMSAA), 2160p rendering. I call this one "Miranda's Super-Hot Posterior" because, well… I also think of this sequence in the game not-so-fondly because I've seen it many a time after having to re-roll my Shepard after realizing that while he/she looked fine standing still, things got ghastly once the game got going. In a break from the two main games for the week comes one last shot from Star Trek Online, this one of the planet Vulcan. That's a big q-tip that fella's got there. Tools and tricks: Cryptic demo recorder, 2160p rendering, free camera, custom FOV, timestop, offline antialiasing. Hoo, buddy. 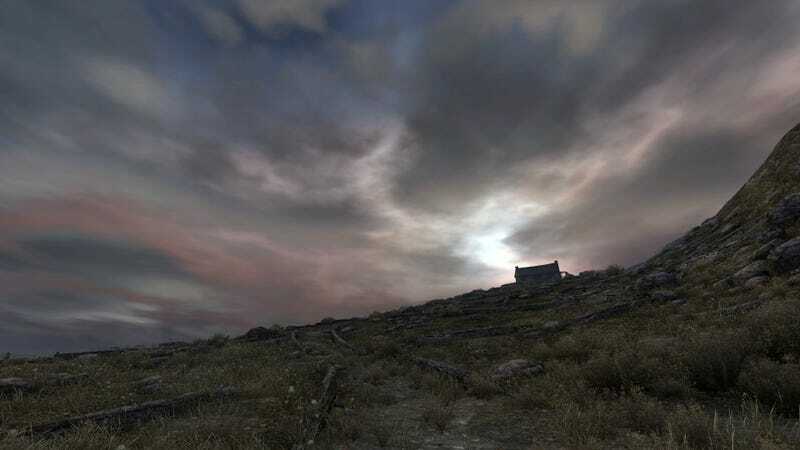 Yet another gorgeous shot from Dear Esther. Another Dear Esther bit of amazingness. "In The Temple of Love"
Dear Esther. Don't have much to say for these other than "wow." Tool and tricks: free camera, custom FOV, 2160p rendering, antialiasing (injected SMAA). Look at that business! Look at it! Man, I can't wait to play Dear Esther.